Cut through the noise with state of the art digital advertising at Blackburn’s brand spanking new bus station. With the distractions of modern life make there is increasing competition for people’s attention – help your business, event or promotion jump to the front of the queue with multi-media advertising. For just over £50 a day you can give your message or event pride of place in the £30 million bus interchange that will welcome around 60 thousand travellers a week. 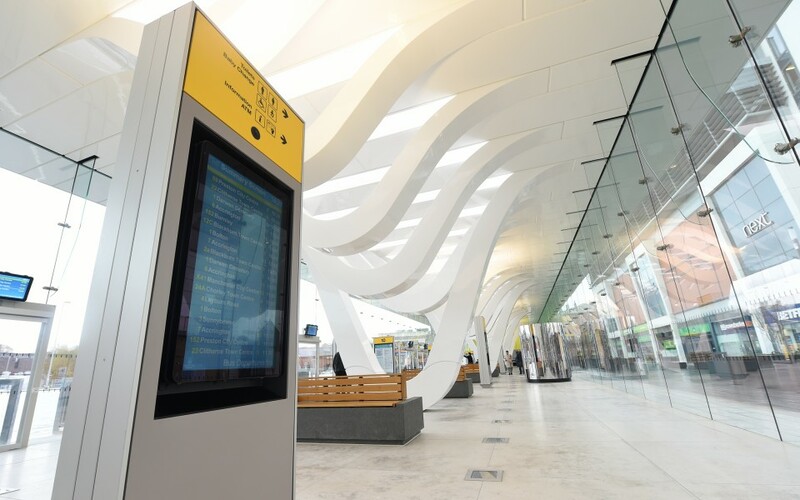 Displayed on five high definition positioned in places of high footfall and waiting areas, the screens will guarantee your advertisement will be seen by passengers. The screens are video capable and can play footage, animations or still graphics and open up limitless possibilities for creativity. Other advantages of digital advertising include time specific adverts – are you a café offering Blackburn’s best coffee? Do you have a lunch time deal that shoppers just can’t miss? We can schedule your advertisements in the morning to catch early commuters or at lunch time to tempt hungry passengers arriving in the town. If you’ve got a special promotion or store opening make sure shoppers know about it first and make a beeline for your shop. And events can maximise awareness and attract arriving visitors looking for an activity or family day out. Speak to our knowledgeable advertising team who can advise you on how to make the most out of advertising for the digital age. Combination packages and discounts are available for block bookings. Call now on 01254 585551 to book your slot. Or click on the link below to access other advertising opportunities.